Jordan Series Drogue, part 1: why choose this? There are a number of options for how to deal with seriously heavy weather at sea; I have lately settled on carrying a Jordan Series Drogue (JSD), as this feels like the best option aboard AUKLET. Getting this equipment sorted out has involved everything from the original choice of a JSD, to appropriate design for this particular boat, to the related subject of attachment plates, and where to get all of the various parts, as well as the drogue itself. Maybe we’ll never have occasion for the post about deploying it – that would be fine with me, and in the meantime I get to have a lot more peace of mind when on open water, too far out for a quick day’s run into a harbor when the forecast turns unexpectedly stormy. This series of posts is going to include quite a number of references and links, and as usual I am not receiving anything for including those references in the blog. A ridiculous amount of time has gone into figuring out a specific drogue plan that feels both reliable and sensible, and then finding the materials to carry it out. It is my hope that by sharing these details, other folks who are interested might not have to spend quite as much time searching to come across the same parts and information. I also want to emphasize that I am neither a professional, nor any kind of certified engineer. This is not advice for anybody else – it is simply a recounting of what I have come up with for myself. If it’s helpful to others’ thinking on the subject, that’s great! For starters, what is a Jordan Series Drogue, and why would one choose it? “What” is the easy part of the question: a long length of line, as much as 200 feet, up to 300 feet or more for large boats, with small fabric cones, each of them 5 inches in diameter at the big end, woven into the line at intervals of 20 inches. There can be anywhere from 80 to close to 200 cones, depending on the size of the boat. This line with cones is attached to a “pennant” of some length that has no cones, between the boat and the drogue itself, and the pennant is connected by a bridle to the stern of the boat. The cumulative effect of the correct number of cones for a given boat is to reduce the movement of the boat during a storm to a slow drift of about one to 1 1/2 knots downwind. The hold of the drogue on the water keeps the stern facing into the waves, preventing broaching (turning crossways to the waves, and potentially being rolled), and the drogue also holds the stern down as the boat is lifted on a wave, preventing pitchpoling, or somersaulting of the boat over itself as the bow dives down. As mentioned above, there are several different approaches for managing storm situations – my interest in the Jordan Series Drogue has been an evolution. One of the particular arguments for a parachute sea anchor that is led from the bow is that it keeps the bow to the waves, and the companionway away from the waves. I like that argument. Another argument for it is that other than for the occasional checking, it requires no active participation. There is no steering while the sea anchor is deployed. The boat is hove-to, and there is no necessity for constant exertion. On the other hand, most times when drogues off the stern are spoken of, it has been in the context of actively steering downwind, throughout a storm. In this active case, a drag device smaller than a parachute sea anchor – generally referred to as a drogue – is led off the stern to slow the boat, preventing the bow from nosediving into the next wave ahead. Steering is ongoing, often by hand, as autopilots are likely to struggle in these conditions. The steering is to ensure both that the boat continues on course overall, and that it does not turn crossways to the waves. Steering throughout a long storm is absolutely not on my list of preferred activities! Besides being exhausting and unpleasant, that exhaustion can lead to hazards and potential bad outcomes. This is true even on a boat with crew, never mind for someone who is singlehanding. Since I was familiar only with the concept of drogue use that requires steering, I didn’t go further in considering them for storm management. Then last year, reading more of Roger Taylor’s work about his travels in MingMing, it finally dawned on me that he was saying that when he deployed his Jordan Series Drogue in an enormous storm, he lashed his wind vane steering up out of the way. And once the drogue was deployed, Roger settled into his cabin for the duration. No steering! Not even any adjustments. He had attachment plates – heavy chainplates, leading aft – on the stern of the boat, to which the drogue bridle ends were shackled, and this arrangement completely took away the problems of chafe and related checking and adjustments. Wow. Added to this, because a Jordan Series Drogue is a long line of many, many tiny parachutes, the problem of being in sync with the waves also goes away, as the braking force is applied throughout different parts of more than one wave. Revolutionary. This did leave the problem of the companionway facing the following seas. (Roger Taylor doesn’t have any problem with this issue, having changed his companionway to a watertight hatch.) I’m still not entirely relaxed about this question, but according to the writings by the JSD designer, Don Jordan, discussing both the many tests he did as well as reports received from users, and also according to writings of folks who have used it themselves in heavy storm situations, following seas running right into the companionway have not been a big problem. Don Jordan wrote a bit on the subject of explanations for why he thought this was turning out okay. His writings also confirm that this device is considered a “passive” heavy weather tactic, requiring no steering. Bingo. The other reported problem for Jordan Series Drogues is difficulty in retrieving them. This is a noticeable issue. According to various reports, including from Roger Taylor, hand over hand it’s a terrible, long job, especially when the wind is still blowing moderately. 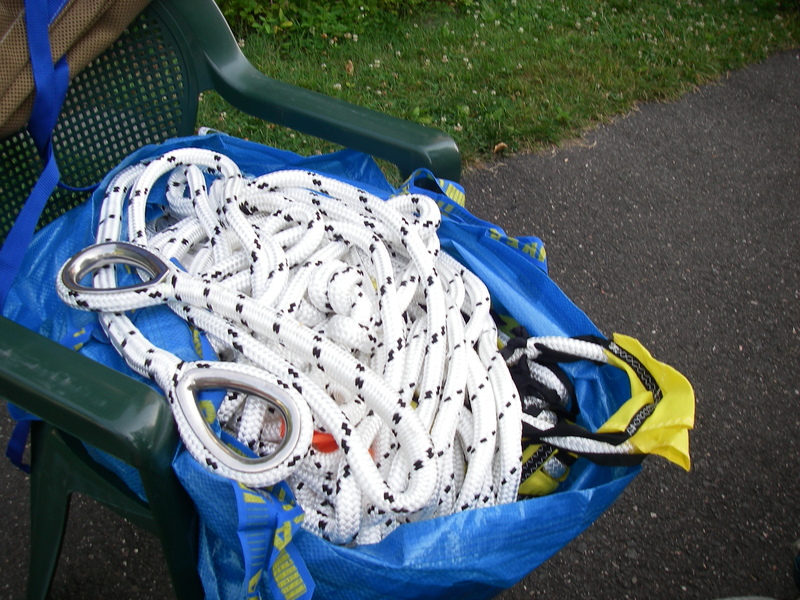 It’s also important not to just wrap the part of the drogue that has the cones around a winch – some people have experienced enormous complications with overwraps, doing that, as the cones get tangled in the wrapping line. On the bright side, it works out fine (according to others’ accounts) to use one or two separate lines – dock lines or whatever – to a winch, with rolling hitches onto the JSD line, cranking in, switching the lines to the winch, etc. This could probably take some time, but folks with average capabilities have reported doing it in a half an hour. The most important thing is that when deploying the drogue, an extra line should be tied at the apex of the bridle, led loosely back to the cockpit, so that when it’s time to retrieve the drogue there is something to start with. Searching for more recent remarks from Lin and Larry Pardey, the drogue retrieval issue was the biggest negative mentioned. Looking at all of the various factors, and options, their difficulties and their resolutions, I am feeling good about shifting my approach to the JSD. Work on this has been underway for a while now. When I started writing this post, I had the silly idea that it was going to be all one entry. That would be a bit much, it appears! So I’ll leave it here, and begin again next time with how the design and boat modification have proceeded. Pretty nifty! I have also acquired (somewhere) the idea that the drag is adjustable, by putting more or less of the drogue in the water. It’s an interesting question, about the possibility of putting less of the drogue in the water. I’m not quite sure how that would be achieved, at least for serious storm conditions. One of the complications is that the section with the cones is out there at the far end of the long pennant. Maybe somebody was adapting for less-serious conditions? Just putting out part of the section with cones, and leaving aside the pennant? There would still be the question of the attachment to the bridle. If you run across the source of that thought again, I’d be very interested to hear the details. Roger Taylor did talk about leaving less of the drogue in the water, on his way to hauling it back in, in his account in the Tonic of Wildness book. That particular story was complicated, with several issues going on… And larger boats use two line sections with cones, the farther out section on somewhat lighter line. In that case it would be easier to remove the second section – I wonder if somebody was doing that? Anyway, I’ll be keeping an eye out for more on this question!